"I just got a game that says it needs a specific version of Flash. Is there any way I can check what version of Flash I have installed on my computer?" Flash is largely backward compatible, so as long as you are updating it when you get a notification on your computer, chances are good that you already have a version of Flash that will work. Checking which version you have installed depends a little on which browser you are using as each browser stores the information in a slightly different way. For Internet Explorer you need to click on Tools > Manage Add-ons. 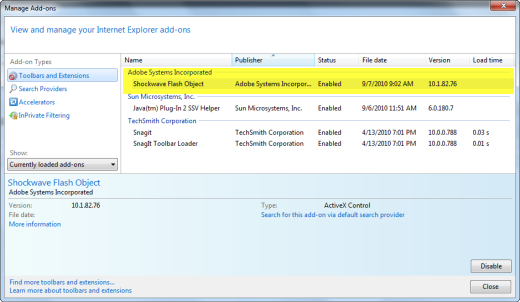 The Toolbars and Extensions list will show you which version of Flash you have installed as a Shockwave Flash Object under Adobe Systems Incorporated, similar to what is pictured below in the screenshot of the Internet Explorer Manage Add-ons window. If you have Google Chrome, you can access the list of plug-ins installed on your computer by typing chrome://plugins into the add-on bar. Flash will be listed, with the version number, in this plug-ins list as long as you have Flash installed.